A school mosaic is a wonderful way to get students involved in a creative, collective and unique activity that each child can be part of. It develops skills, builds confidence and is the perfect medium for all abilities....you don't need to be 'good' at art to get fantastic results. Children with additional needs are equally able to participate and the process of mosaic means that there is something for everyone. Each mosaic project is tailor-made for the individual school and its pupils. 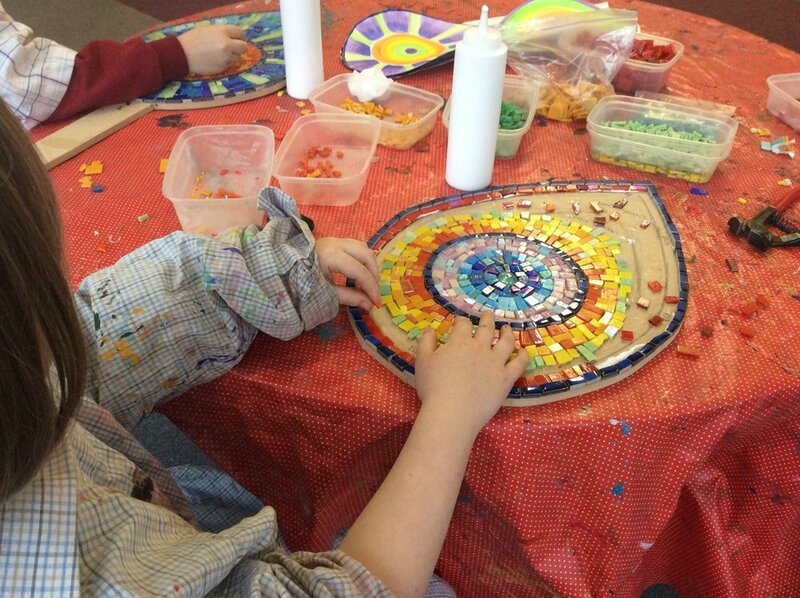 Schools can choose to do one large mosaic or for each child to work on their own individual mosaic to take home with them. The 'Springfield Community Campus Mosaic' is the work of 4 local primary schools and was part funded by The Arts Society (formerly know as NADFAS). Each school was allocated 3 contact days and Emma was supported with the help of volunteers from the local (Corsham) Arts Society enriching each child with valuable one to one time with the artist. Previous ventures have included a maths theme where each year group produced a mosaic panel incorporating shapes and symmetry. The children were heavily involved with the design stage and the finished panels were installed in the school’s garden for the children to enjoy throughout the year. The children of St Stephens C of E Primary School in Bath worked collaboratively with Emma in producing this mosaic birdbath for their garden. Emma's vision for this piece was for the children themselves to be central to the design process which grew organically as each child worked with her on a one to one basis. Whilst Emma had an overall theme and idea based upon the schools core principles it was up to each child to decide how they wanted it to evolve. This project was completed in 5 contact days with an additional day for design, preparation and grouting. Design decisions are constantly being made within each section of the mosaic and the children were positively encouraged to engage with this and really think about how best to go about it. This means they are completely invested in the work with a real sense of ownership and pride in the results. A Tree of Life was created with the children from Tockington School which involved every child in the school and became Emma’s largest school mosaic to date. An artistic assignment is an inspiring way for children to creatively connect with each other and it provides the school with an opportunity to showcase the kind of positive experiences it offers pupils. Thank you for enquiring about school visits, Emma will get back to you as soon as possible!